Learn - Why you may be looking at your number one energy drain - your windows! The first rule of renewable energy use is to reduce your energy requirements. Solar PV panels may be a cool visual statement but in some cases it's like watering your yard with bottled water. Gilkey Architectural Windows and Glass Facades has just published a Primer with the assistance of Green Cincinnati Education advocacy on using glazing to assist in achieving LEED Certification Credits. From basic Prerequisites and Energy Modeling Simulations in EA Credit 1, you'll learn how the right glazing selection can impact your design and contribute to Material Resources and Indoor Air Quality with recycled and regional content along with all the operable styles available. For more help navigating the LEED waters, give us a call at 513-260-9025 or email. We're always glad to answer any questions and show you were to find the answers on the USGBC website. 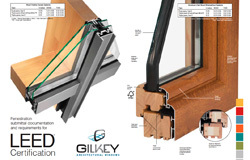 Download Gilkey's Window LEED Primer here.